With a kitchen, a toilet, and a shower only for B-2. Property 8: With a kitchen, a toilet, and a shower only for B-2. 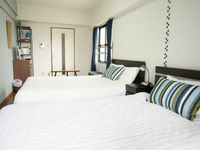 101 Fukuoka dog&cat house 8min from sta. Property 10: 101 Fukuoka dog&cat house 8min from sta. Easy access to Tenjin and Hakata Sta.! Property 20: Easy access to Tenjin and Hakata Sta.! It was convenient to move because it was close to the station. Personally, I prefer to rent or carry a car.